THE SNP is on course to win a third successive term in power next year, despite some voters viewing the party’s performance in key areas of government as “poor”, a new poll has found. Almost two-thirds – or 62 per cent – of those who expressed a party preference said they are planning to vote SNP in the constituency section for the 2016 Holyrood election, up two points from the previous month, according to the survey by TNS. A total of 54 per cent of the 1,029 Scots aged over 16 who were interviewed said they will vote for Nicola Sturgeon’s party in the regional list section of the ballot, an increase of three points. Polling, which was carried out between 10 July and 3 August, gives the SNP a massive 42-point lead over Labour in the constituency ballot after its support remained unchanged at 20 per cent. That level of support would give the SNP a third election win in a row, the first time a party had ever achieved such a series of successive victories under Scottish devolution, if it was replicated in May 2016. The findings came after the SNP won 56 out of the 59 seats in Scotland on a 50 per cent share of the vote in May’s general election, in which Labour won just 24.3 per cent and one MP. Meanwhile, the TNS poll showed a slight drop in Labour’s vote for the regional section of the Holyrood election, down by one point to 20 per cent – 34 points behind the SNP. 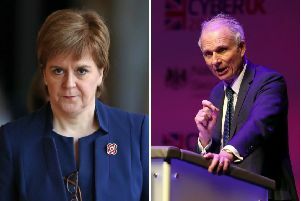 The SNP leadership hailed the findings as further evidence of the “extraordinary levels” of support for the Nationalists who are now the third biggest party at Westminster. However, the surge in SNP support came despite widespread scepticism among the electorate about how well the party is governing Scotland. On key areas such as the economy, crime and justice and the NHS, the TNS poll found just a third of Scots said the SNP government is doing a good job. Almost three out of ten (29 per cent) people ranked the government’s performance as “poor” on both health and crime and justice, with a third (34 per cent) and less than a quarter (23 per cent) believing ministers are doing a good job in these areas respectively. When it comes to the economy, 25 per cent said the Scottish Government is doing well, with almost the same proportion branding the SNP’s handling of the area “poor”. Almost a fifth (19 per cent) of voters are unhappy with how the government has dealt with education, compared to 30 per cent who ranked performance as “good”. Opposition parties at Holyrood said the findings highlighted deep-rooted public concerns about the SNP’s record on delivering public services since the party came to power in 2007.